Day Two Hundred and Seventeen. 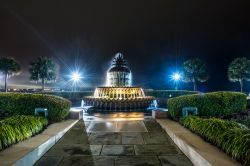 Went out for a quick stroll around Charleston's historic district after dinner just to see what was around. Didn't end up taking very many shots, but I think I got a few neat ones. I can't decided which I like better ... the bridge disappearing into the low cloud cover, or the fountain. Which do you prefer?